While there are several electrical, chemical, and mechanical plating techniques, the two major plating techniques include electroplating and electroless plating. In a very simplistic example, electroplating consists of an anode (positive charge) and a cathode (negative charge) that are each immersed in a solution. For example, if the anode is made of nickel and the cathode is a copper part, then when a current is applied, positively charged ions (small pieces of metal) from the anode flow through the solution to the cathode and attach themselves to the part, producing a layer of nickel on the part. 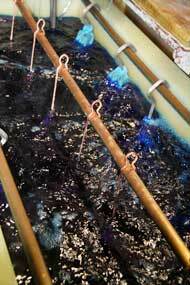 In actuality, the electroplating process is far more complex with additional reactions taking place at the anode and cathode. The solution chemistry is very complicated and the nature of the current used is very important. The concept, however, is that by making the part the cathode in an electrical circuit, positive metal ions are attracted to the cathode and deposited (plated) onto the surface. Electroless plating is similar in result to electroplating in that a metallic layer is deposited onto the surface of a part. Electroless plating, however, uses a chemical deposition process - instead of an external electrical current - to achieve the desired result. 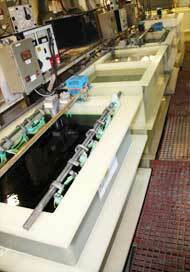 Nickel is the most common plating material deposited in electroless plating processes. Electroless plating provides a more even plate layer than electroplating, even on complex geometries. 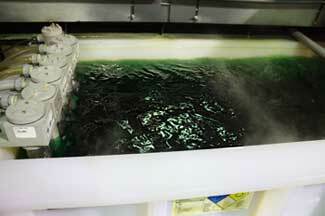 Electroless Nickel Bath: a chemical deposition process. If specific areas on parts need to remain free of the plating material, they can be masked with plugs, caps, resists or lacquers, which are then removed after plating. 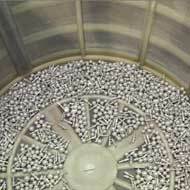 The baths that are used for plating vary from acid to neutral to alkaline with many different chemical formulations involved. The common requirement for all baths is that they must be capable of maintaining the correct amount of the material being deposited in the solution. Hi-Tech Plating maintains the very complicated and accurate bath controls that are essential for producing proper deposits.